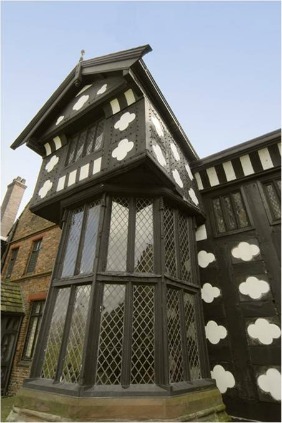 Ordsall Hall is one of the oldest buildings in Greater Manchester and parts of it date back to 1351. It was recently re-opened following a historical restoration that took over two years to complete. The lengthy renewal period was a result of the desire to remain as true to the original appearance of the building as possible. Some of these time consuming measures are listed below but when looking at images of the restoration it was time well spent. The restoration of historic buildings is something that Pilkington has been involved with on many occasions. We provide a variety of glass solutions for architects and home owners who are keen to keep and make the most of the period features of a building. Pilkington Spacia™ provides an aesthetically pleasing, cost effective method of improving the energy efficiency of older homes, providing double glazing performance in an insulating glass unit just over 6mm thick, helping to reduce heating bills and draughts that are often associated with older properties. This revolutionary vacuum technology helps Pilkington Spacia™ resist internal condensation. The installation of Pilkington Spacia™ will also help to improve the carbon footprint of the building. Pilkington Spacia™ offers good acoustic performance so reduces noise, and is suitable for situations where weight saving is a requirement such as sliding box sash windows. So, if you are currently working on a project that requires a consideration for the aesthetic legacy of a building be sure to read more into the Pilkington Spacia™ range by visiting our website here.